New ToolCell XT automated tool changing press brake with extended tool storage capacity holds 50% more tooling. ToolCell XT is the solution to today’s small batch, high mix manufacturing, offering minimal changeover time, high accuracy and high productivity. The large capacity of tools housed within the press brake provides the flexibility to handle a range of bending jobs. Built-in Easy-Form® Laser adaptive bending system ensures part accuracy. ToolCell XT holds three rows of punches and seven rows of dies with each row containing 12 toolboxes equally spread along the entire length of the machine. 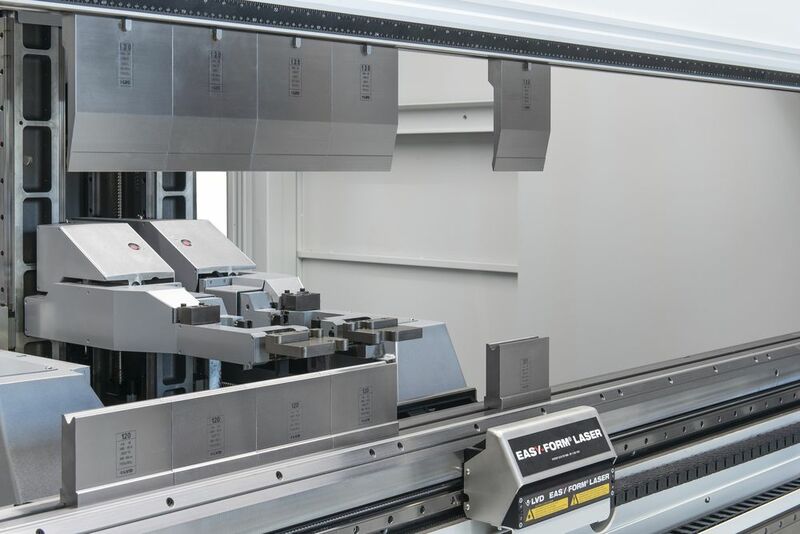 With its extended tooling capacity, ToolCell XT offers the versatility to handle varying material types, organize tooling by material type, easily switch between stainless steel and mild steel applications. The latest generation ToolCell features LVD’s powerful Touch-B control. Intuitive graphical icons are used to quickly and easily manage all parameters of the machine. 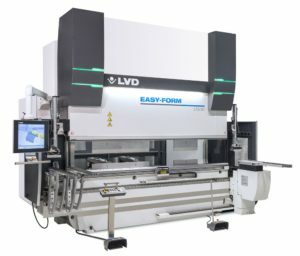 With Dyna-Cell, LVD takes electric press brake automation to a new level for high-speed bending of small- to medium-sized parts in high volumes at bending speeds up to 25 mm per second. Dyna-Cell is built on LVD’s proven Dyna-Press electric-drive platform. 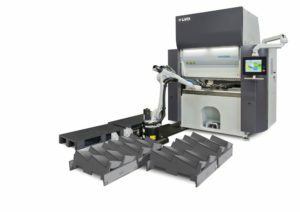 The cell combines the Dyna-Press Pro 40-ton press brake with 1500 mm working length and five-axis backgauge with a Kuka industrial robot to offer maximum bending productivity in a small footprint of 5 m x 5 m. The press brake and robot function as a compact, integrated unit. Dyna-Cell’s design concept also allows for unmanned or manned operation offering a perfect solution for varying batch sizes. The robot features a unique gripper designed and patented by LVD. The gripper fits part sizes from 20 mm x 100 mm up to 300 mm x 400 mm. Users can make bends on three different sides of a part without regripping. Dyna-Cell also offers fast programming of part and robot following the 10-10 rule: 10 minutes for CAM generation of the bending program and 10 minutes for robot part generation. LVD showcased the Electra FL-3015 with new 10 kW fiber laser. Electra FL 10 kW provides ultra-high-speed cutting to achieve premium results at the highest possible output when processing ferrous and nonferrous materials in plate thicknesses up to 30mm. Electra FL is designed to perform reliably, operating as fast as the thermal process allows without dynamic compromise. A welded steel monoframe construction provides exceptional stiffness. As a result, Electra can achieve an acceleration of 2G — or 20m/s². To achieve the full potential of high-dynamic acceleration, Electra uses a lightweight yet rigid cast aluminum gantry controlled by specially tuned servo drives. 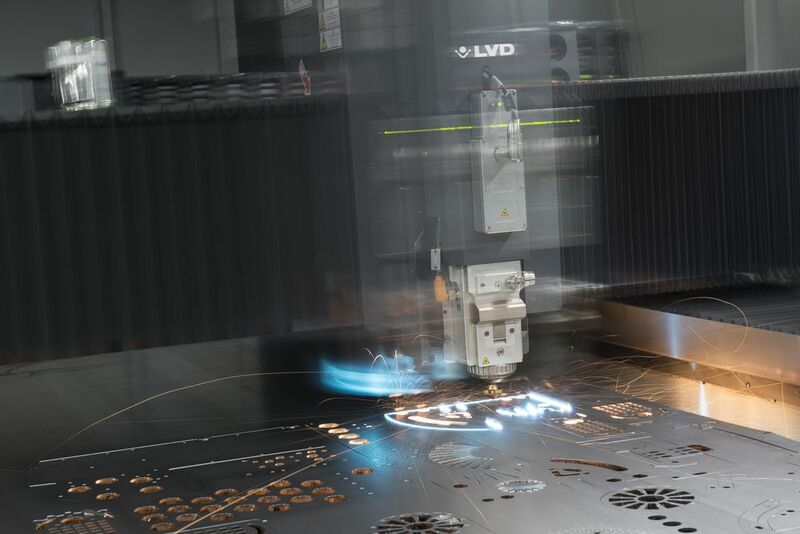 Making its debut in Europe at EuroBLECH was LVD’s TL 2665-FL tube laser cutting machine. 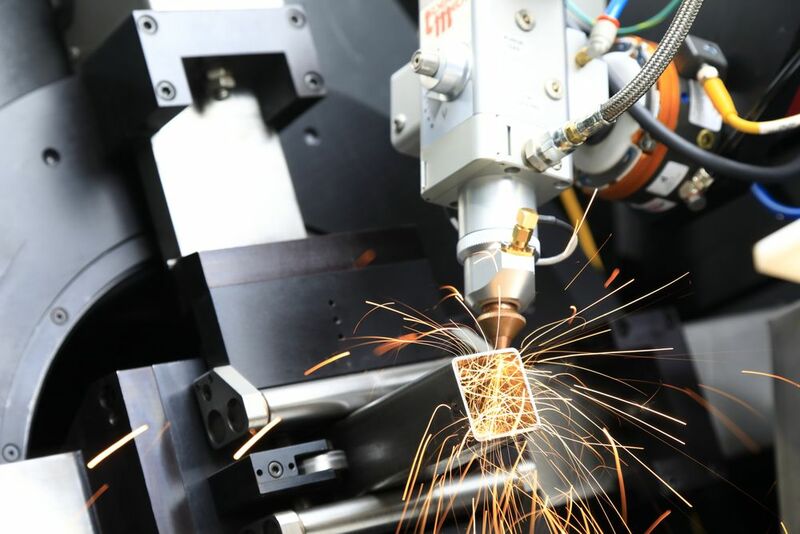 The TL 2665-FL efficiently processes round, rectangular, square or other standard tube profiles up to 7925 mm long in a range of materials and at optimal speeds using a 2kW fiber laser. A cost-efficient design, the TL 2665-FL offers more value for the investment, equipped with a standard 7-position magazine-type automatic tube loader, automatic setup and run, bow detection and twist compensation features which minimize downtime and increase tube cutting output. The TL 2665-FL was enhanced with a high-performance Fanuc laser package and Fanuc touch-screen control. The Fanuc fiber laser source delivers consistent power for thousands of hours, has long service intervals and minimal maintenance costs. The control supports high-speed processing with a suite of intelligent laser control functions to help optimise cut quality. LVD’s Easy-Form 80/25 press brake is the ultimate smart bending machine. Equipped with the Easy-Form® Laser in-process angle monitoring and correction system, this press brake adapts in real-time the ram position to ensure the desired angle from the first bending operation. The bending process is not interrupted and no production time is lost. Designed with the operator in mind, the Easy-Form press brake is also functional and user friendly. Status lighting built into the press brake ram covers offers a visual indication of the machine’s operation status, enabling more effective shop management for higher throughput. An optional LED lighting system illuminates the back gauge and front work zone areas to provide better operator visibility and increased worker safety. Numerous features and options further enhance productivity, including Touch-B control, front supports and guide rails, programmable sheet followers, various backgauge configurations and more. As the trend toward digitalization and smart manufacturing advances, LVD continues to drive the factory of the future with its integration philosophy and CADMAN® software suite. CADMAN looks at the big picture and helps streamline the complete fabrication process – from production control, communication, planning and management to punching, bending and laser cutting – through integrated, database-driven software that gives real-time insights from the shop floor and instant control of production processes. The complete CADMAN Suite will be demonstrated.